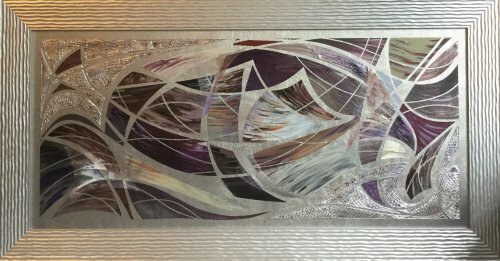 This painting is executed on a textured silver metal panel. It is complemented by a 3D silver frame making this painting a dramatic statement. Sharp, precise lines are contrasted with fluid and organic shapes and movement. The overall effect is intriguing and complex. Every time the viewer looks at this painting, there will be new elements discovered to marvel and enjoy.